Day two of the American Royal BBQ pilgrimage started in downtown St. Louis with sunny skies and temperatures made for shorts. The RV was hitched up and we piled inside for the short jaunt across Missouri to Kansas City. Along the way we stopped at our next dining establishment, Plowboys BBQ. 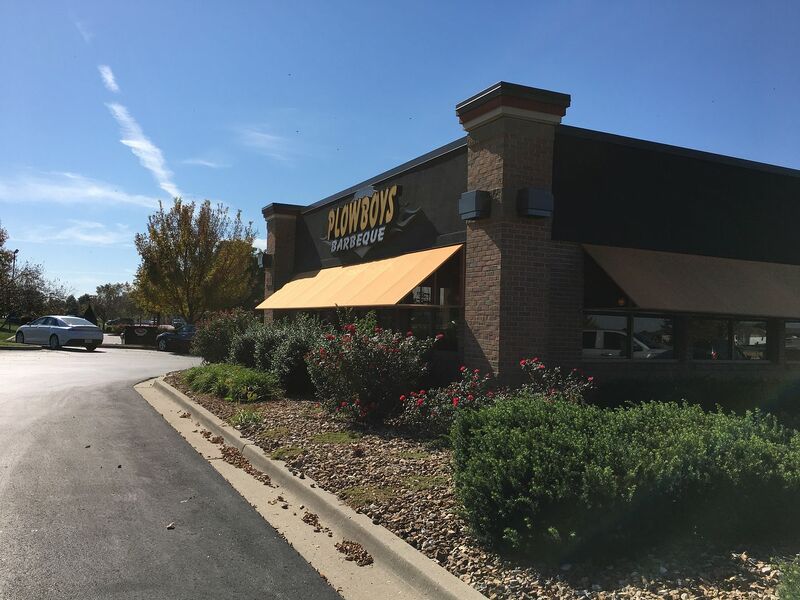 Plowboys has won many awards as both a restaurant and as a competition team. 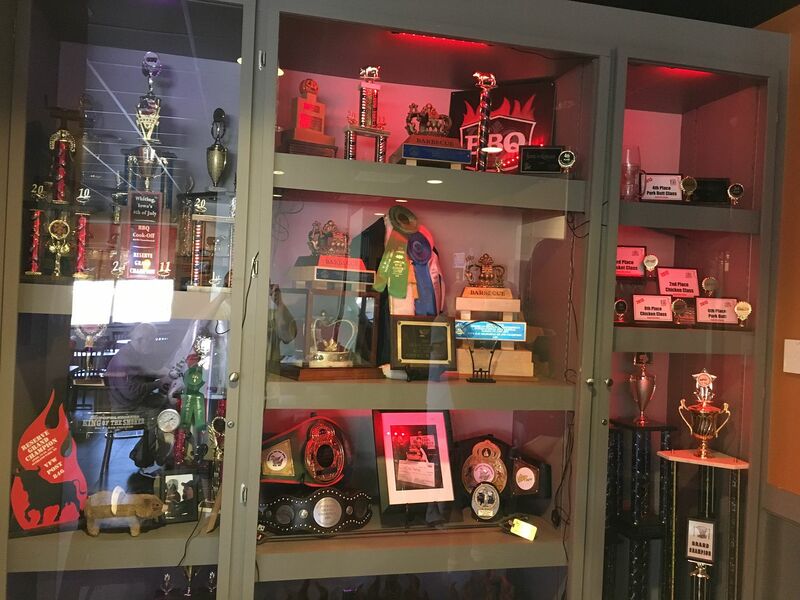 As you can see below, their trophy case is well stocked. The menu contains your basic BBQ staples: ribs, chicken, pulled pork, and brisket. But, they also add some items that I cannot get at a BBQ joint back in Pennsylvania: turkey and hot links come to mind. They are also known for their BBQ Nacho platter. The platter was so big, I saw one feeding a family consisting of two adults and two children with some leftover. It looked really delicious as well. I might have ordered this monstrosity of chips, cheese, jalapeños, and BBQ meat of choice had I saw an example when I walked in the door. 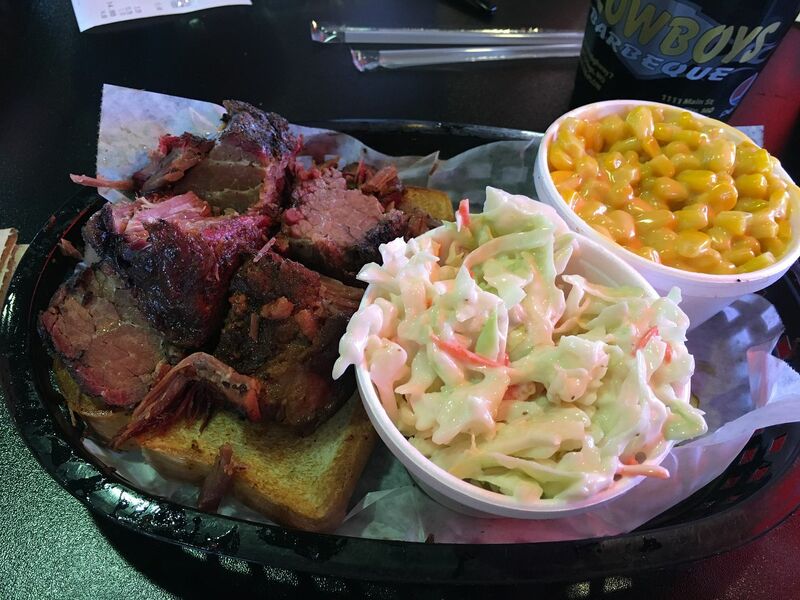 But, based upon having been voted the best burnt ends in KC for 2014, I decided to try the Burnt End Platter with sides of Cheesy Corn and Cole Slaw. I also picked up an order of their smoked beef sausage for public consumption at our table. The slaw was ok. A little bland, but the cabbage was crispy and not mushy or swimming in dressing. I am just used to slaw that has a nice and tangy dressing. The Cheesy Corn is another thing. Where have you been all my life? Have you ever made stovetop mac and cheese? The kind where your boil your macaroni, then dump in back in the saucepan with milk, butter, cheese, and slowly heat and stir until the mixture is melted and combined thoroughly? This is how I think Cheesy Corn is made. As a matter of fact, a Cheesy Corn entry won the vegetable category later in the week at the Royal. I can see why. The burnt ends were good, but not life changing. I had some that were perfectly cooked, some that were a little on the dry side, and some that were a bit rubbery. That may have been a function of sitting in a warmer behind the counter. The sausage was on point. Not too fatty, seasoned well with just the right amount of smoke and the all important snappy skin. There were four sauces to choose from on the table. I focused on the Sweet 180 and the KC Sauce. The sweet sauce was a little too sweet for my taste, but I was drawn to their KC Sauce. A hint of smoke with a good balance of tangyness and sweet. It paired very well with both the burnt ends and the sausage. This visit to Plowboys was a good start to our BBQ tour. The service was friendly and efficient. The food was good, but not outstanding. If I lived in the area, I would come here once a month for lunch. But, I don't think I would drive out way of my way for the burnt ends. Maybe for the sausage though. Overall rating, 3.5 out of 5 stars. 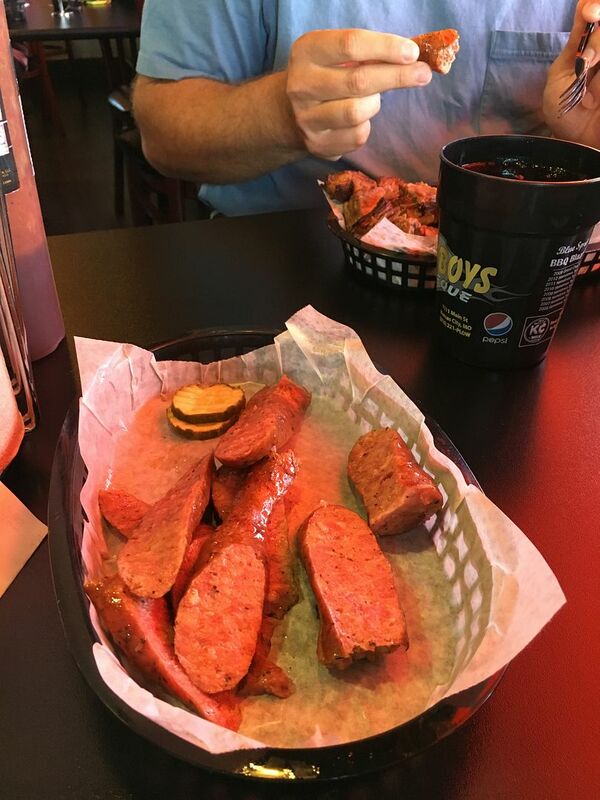 We made an observation that almost every bbq joint in Missouri serves pickles with their bbq. I love pickles with bbq. Does not happen out west. Looking forward to more of your adventure. Chilebrown, you get pickles out east and down south as well. I like how a nice crunchy dill pickle pairs with a sweet BBQ sauce. I wonder why you don't get pickles out west? Happy New Year BTW!